Elon Musk is a South African-born Canadian American businessman, investor, and entrepreneur. He is better known as the Tesla tycoon, as well as the founder, CEO and product architect of SpaceX. Musk is also the co-founder, CEO and product architect of Tesla, Inc. a company that was founded in 2003 by a group of engineers on the premise of moving towards a fossil fuel free future. The company has designed the world’s first ever “premium all-electric sedan from the ground up” (Tesla). All of Tesla’s car models are electric powertrain and battery-powered, and the majority of the components of the Tesla models are manufactured in the Tesla factory in Fremont, California. This also includes Tesla’s ‘unique set of energy solutions’ that can be utilised by homeowners and business owners alike in order to promote eco-sustainability in all environments. Much like Tesla Inc., SpaceX seems limitless as it crosses technological boundaries, continents and eventually solar systems. SpaceX was founded in 2002 in order to “revolutionise space technology, with the ultimate goal of enabling people to live on other planets” (Space X). So far, the company has manufactured three vehicles: the Dragon, Falcon Heavy and the Falcon 9. The Dragon is a free-flying spacecraft that is designed to transport people and cargo orbiting around space. It is best known for becoming the first commercial (non-government funded) spacecraft ever to successfully deliver cargo to the International Space Station and return to earth. Current developments on the Dragon will eventually allow it to fly crew to and from the International Space Station, with its maiden voyage with crew onboard being projected for the first quarter of 2018. The Falcon 9 is a ‘two-stage’ rocket that was designed with reuse in mind, yet again focusing on the sustainability of resources and in this case, space travel. The Falcon 9 is also the first of its kind as it is the “first orbital class rocket capable of re-flight”. By enabling the Falcon 9 to be reused, SpaceX believes that it can eventually reduce the cost of accessing space, and therefore be making it more achievable for people to eventually travel to, and inhabit other planets. The Falcon 9 was also designed to transport satellites and spacecraft’s including the Dragon into space. Like the Dragon, the Falcon 9’s ultimate purpose is to transport humans into space. 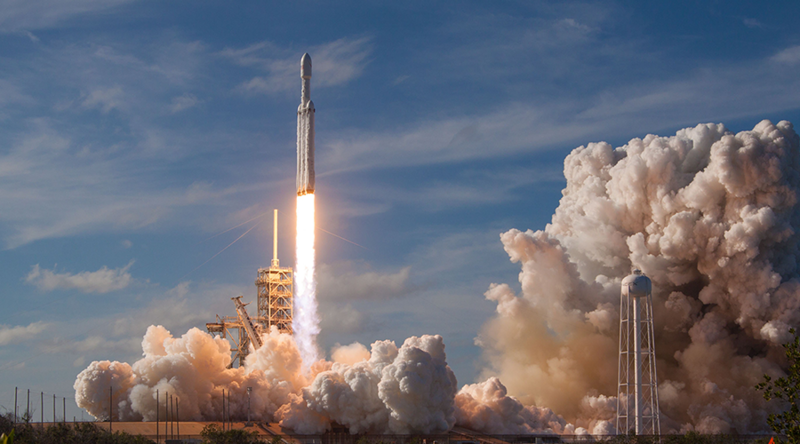 The Falcon Heavy deemed the ‘world’s most powerful rocket’ due to its operational capacity is currently the ‘favourite’ SpaceX brain-child after its first successful launch on the 6th of February 2018. What makes the Falcon Heavy remarkable is that it can lift more than twice the load of its next closest competing vehicle. Even more noteworthy is that despite the size and weight of the Falcon Heavy, the cost of the vehicle is substantially cheaper than any of its closest competitors, yet again emphasising Musk’s desire for a future in which space travel, including to the Moon and Mars, are within reach and affordable for humans by utilising sustainable, cutting-edge technology. Elon Musk is a man of many firsts with regard to the archetypes boasted by both Tesla Inc. and SpaceX. The maiden launch of the Falcon Heavy was also the maiden space voyage for the Tesla Roadster belonging to Musk, as the rocket’s dummy payload. It seems that for Musk, not even the sky’s the limit, more like to infinity and beyond for the futures of Tesla Inc. and SpaceX.